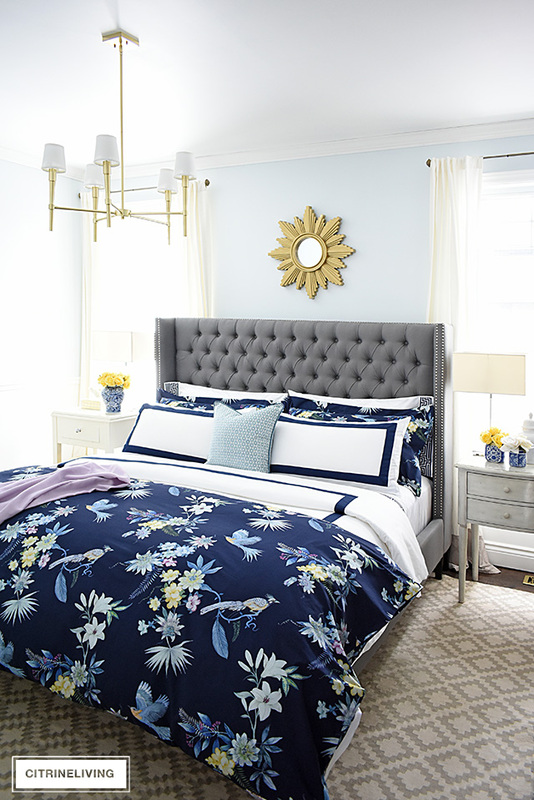 Welcome to our Spring bedroom! 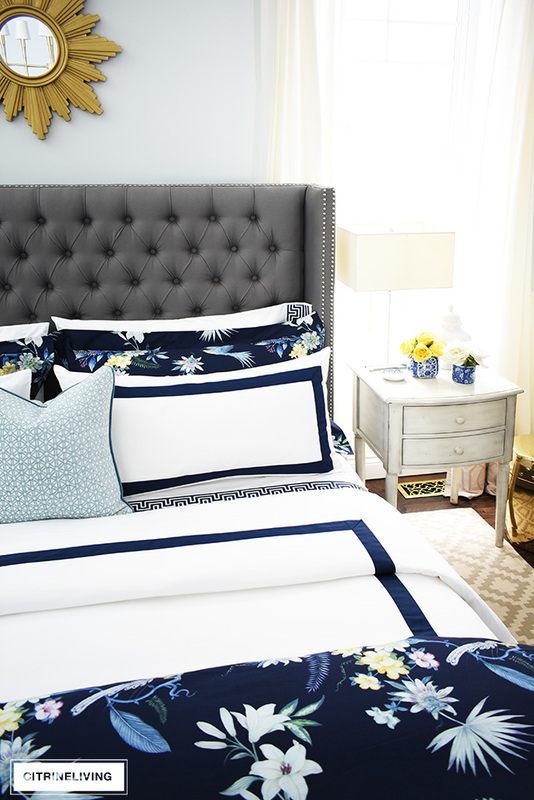 I could not be more excited to share our new Spring bedding with you today. 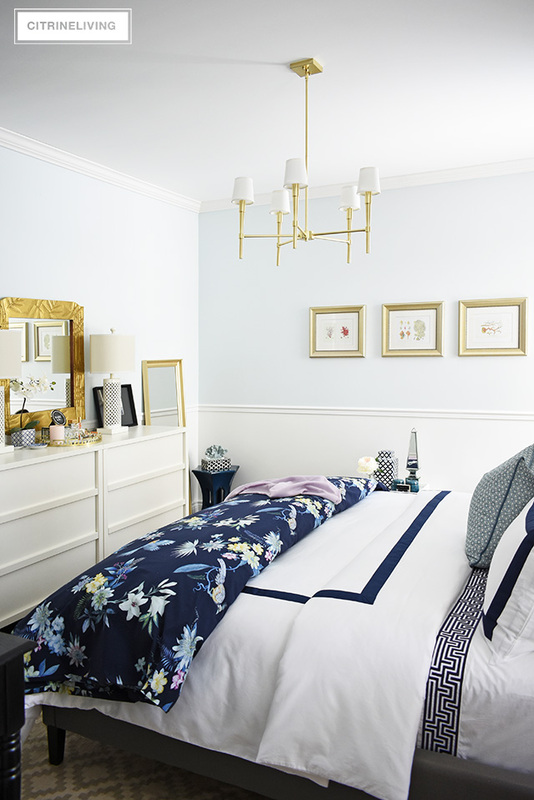 Let me begin by saying that I think this is my favorite look in our bedroom, to date. 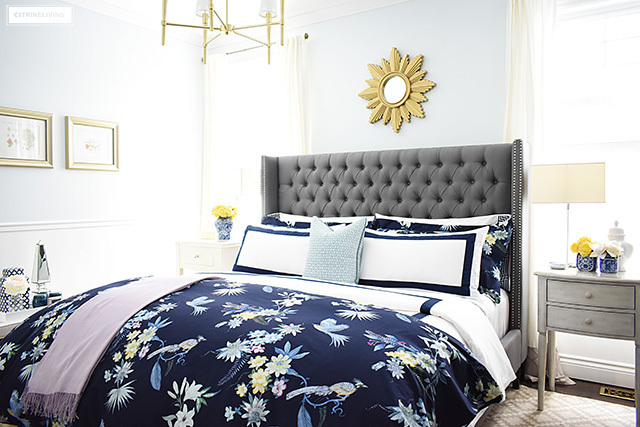 Ok, I know I am always telling you my latest bedding look is my most cherished, but this one really takes the cake for me. I mean, it makes me so happy! Happy is good in my books. 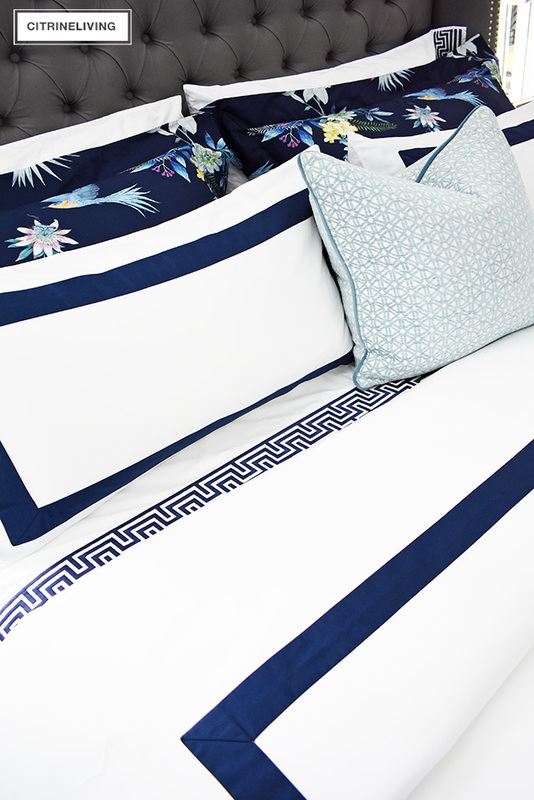 Classic, Italian made, white and navy bedding with a hotel-chic vibe and a stunning chinoiserie print duvet and shams all together on one bed? Total perfection. Did I mention it makes me sooooo happy?! Like a kid in a candy store. This collection was made for me, I am telling you. It could not be more my style and I am in love. I have to extend a huge thank you to Williams-Sonoma Home for sending us this glorious bedding, plus a new duvet insert to go with it. Let’s take a closer look at everything together, and I want to know your thoughts in the comments below – don’t be shy! I always love to hear from all of you! *Affiliate links are provided in this post for your shopping convenience – see my full disclosure policy here. Many of you already know that a big part of my seasonal decorating is to change our bedding. I usually change it in the Fall and Spring, and often I’ll keep the same set for two or three years, and then refresh our space with a new look after that. I often find that bedding can get dingy after a few years, and that’s another reason why I like to replace it after a while. 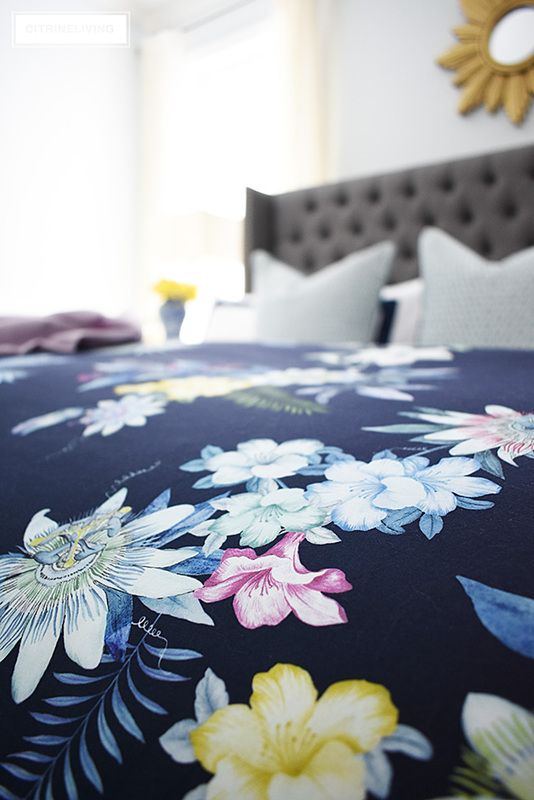 The last couple of Spring seasons have also welcomed gorgeous blue and white print bedding, which I still love…so don’t worry, I’m not getting rid of it any time soon! 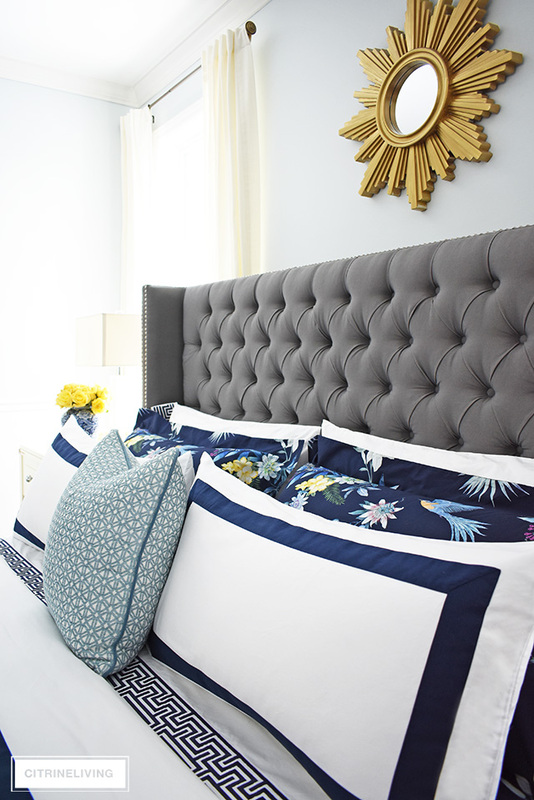 It is one of my most popular bedding looks here on the blog, as well as on my Instagram and Pinterest accounts. 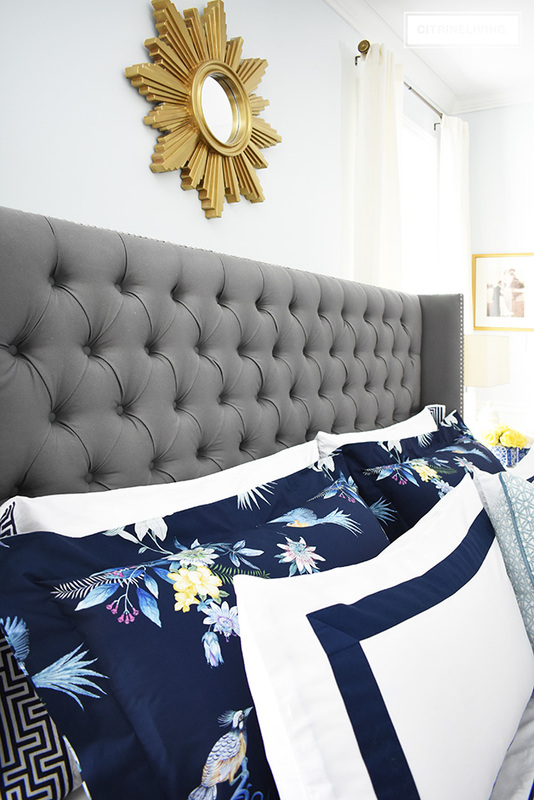 Here on the blog, I have all of my different bedding looks listed under the SHOP tab, and you can browse each look we’ve had over the past few years. Feel free to visit that page here. 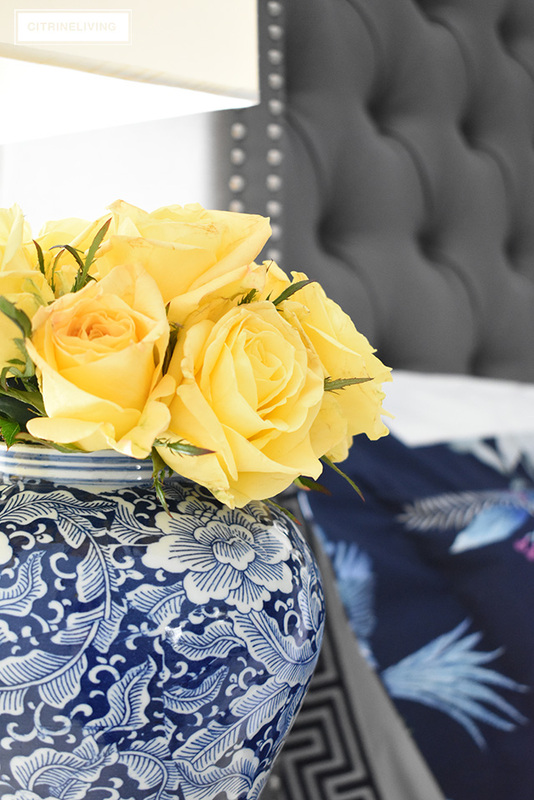 I chose to accent the pattern with beautiful yellow roses in ginger jars and vases, a pale aqua geometric print pillow, and a lavender scarf, so you can see how easy it is to pull out details in a print. Any of the colors in the pattern would be gorgeous as accents. Simple details to pull them out is all you need. 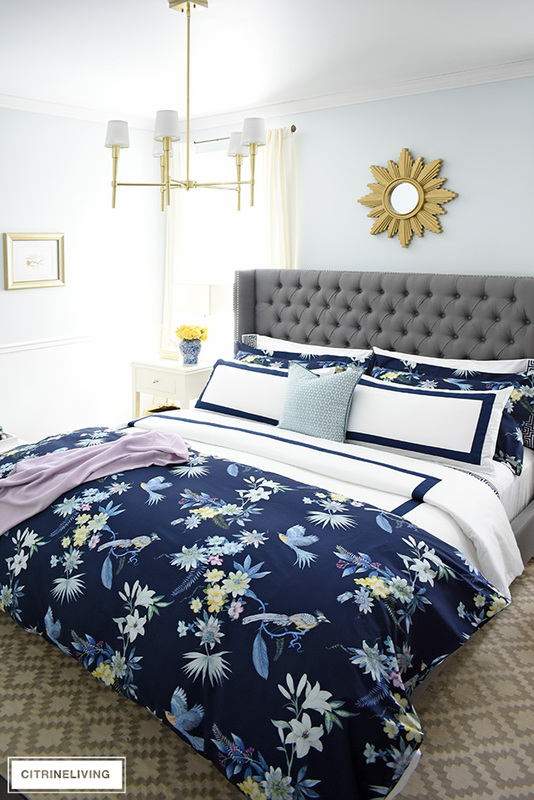 Let’s talk about the Monte Carlo Italian-made duvet and shams – it’s preppy, crisp and clean, and the perfect compliment to the navy floral. 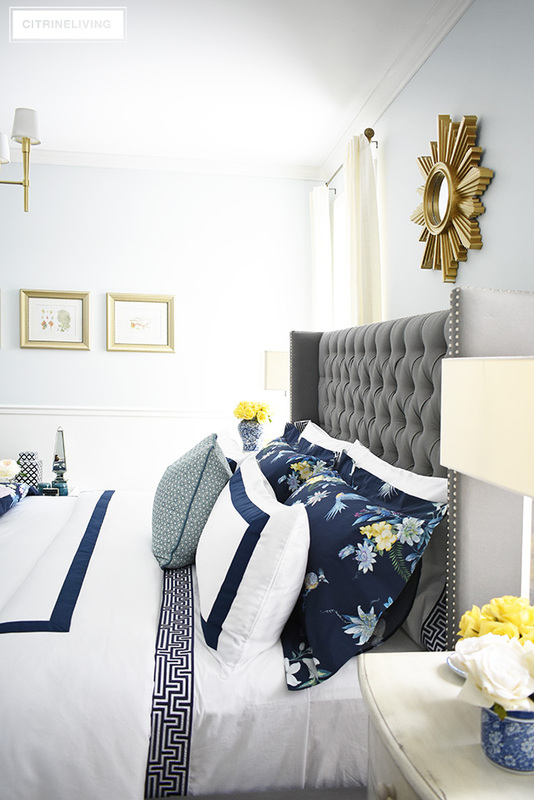 I always love a hotel-chic look for something tailored and masculine, and I love the mix with the soft, feminine floral. 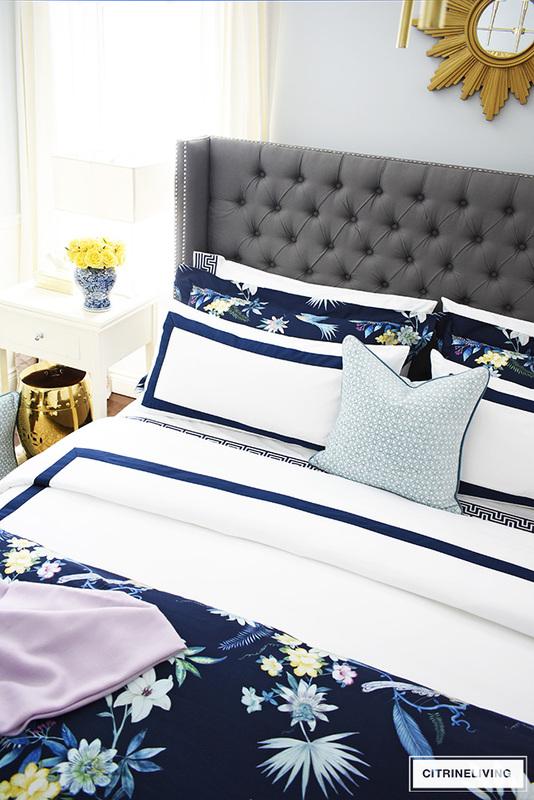 This bedding is luxurious and so soft in a cotton sateen, and is really beautiful to the touch. 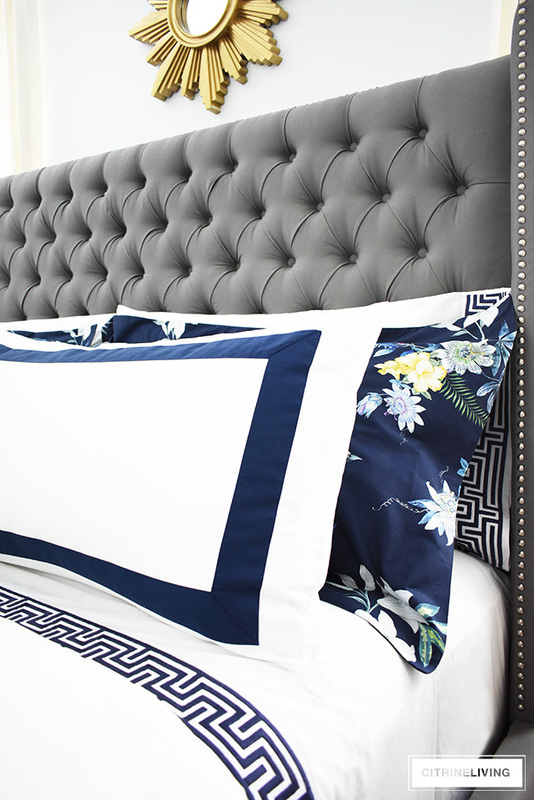 Our Regent Embroidered Sheets in 300-thread-count cotton bring a dramatic sophistication that I love. 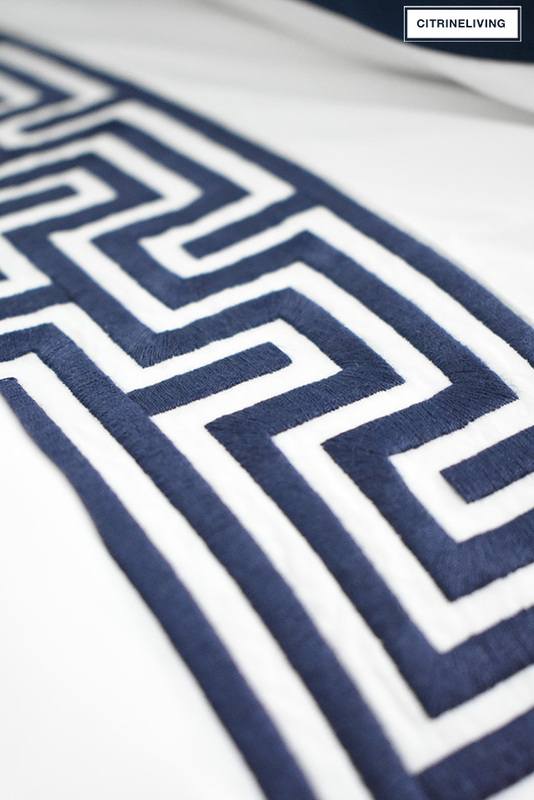 I was so excited when I found these, and just love the classic design of the labyrinth motif – another one of my favorite, classic design elements that is a nod to ancient Greek art and design. 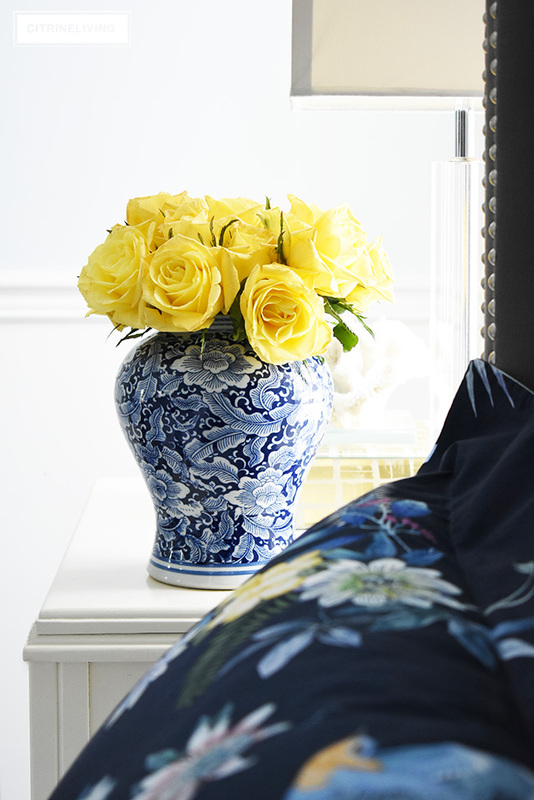 The linear design works so beautifully against the soft, organic floral pattern of the bedding and ginger jars. 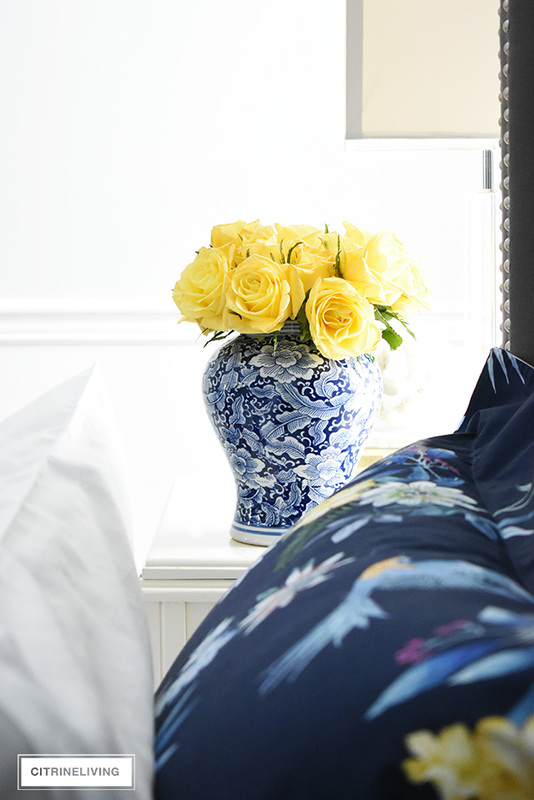 Could this print be any prettier? It’s elegant, timeless and so chic and the color platte is vibrant, but with a subtlety that I love. The beautiful thing about having two duvets is the flexibility of switching them around when I want to. 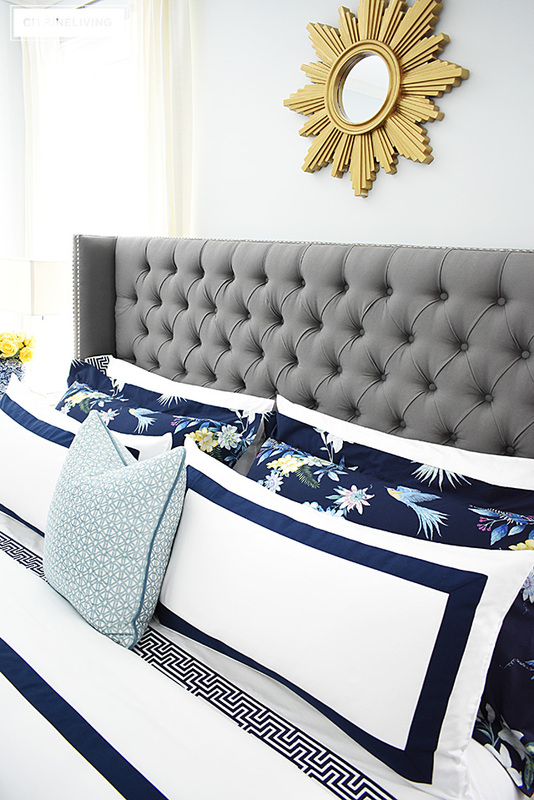 I purposely kept a single pillow to accent the bed, I wanted the pattern in the duvet to speak for itself. I’ve been playing with using two of these, which is also pretty, but I really love to see the graphic navy lines of the shams. 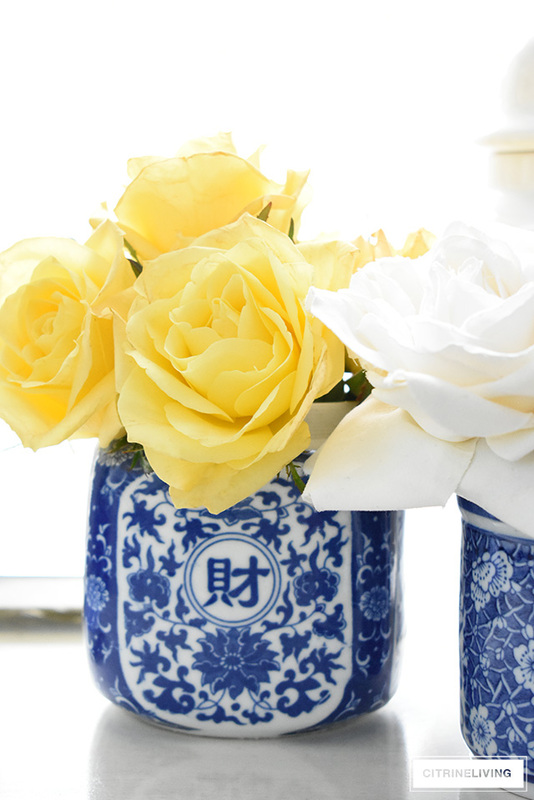 How pretty are these yellow roses against these colors? I think I need to find some beautiful faux ones, because I am loving this look for the warm months. Here’s a peek at the other side of our bedroom. 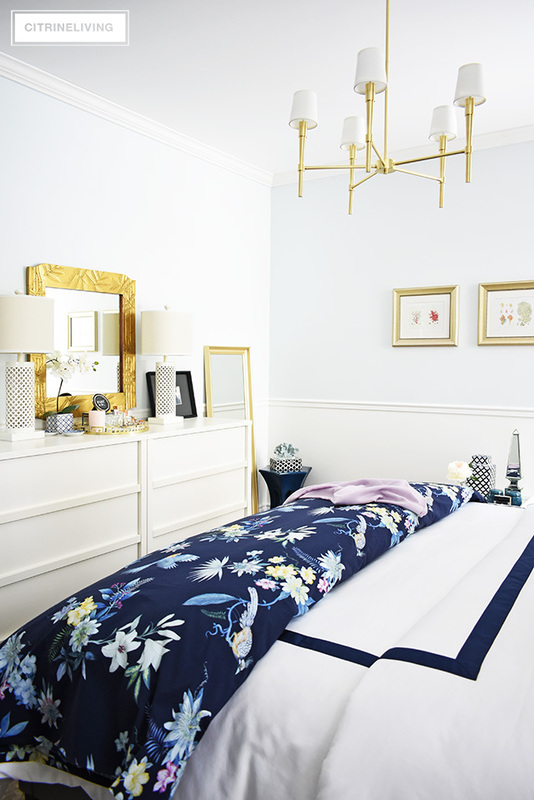 This is one small room, and our king bed fits with just enough space to walk around. The footprint in here is 12 x 14 feet, and while I would do anything for a room twice the size with a lounge/conversation area, our small bedroom functions well and is a relaxing retreat that we love. I was planning to tackle this room for this Spring’s edition of the One Room Challenge, but I decided against it. The timing in April is too busy for me this year, between our daughter’s dance competitions and travelling, work, and family. 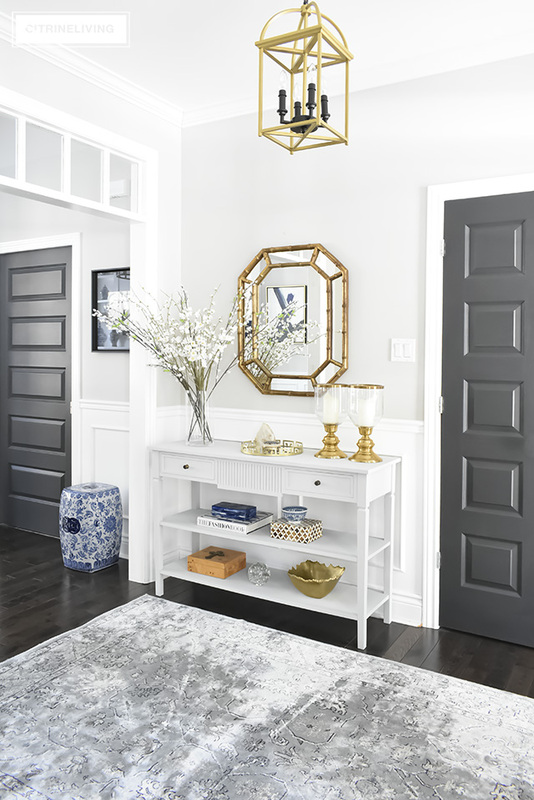 One of the items on my wishlist is to add more moldings above and below the chair rail, like we recently did in our master bathroom – we tackled that space for last Fall’s One Room Challenge – you can see the full reveal here. 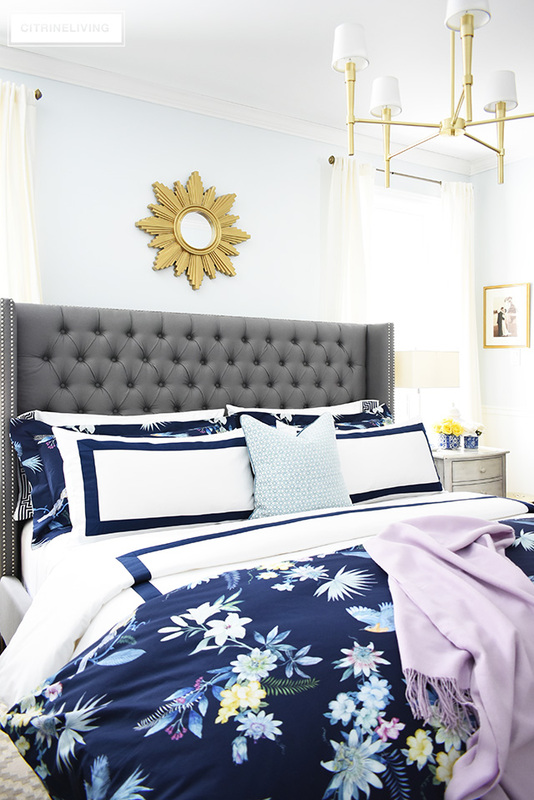 Our gold sunburst mirror made it’s debut last Summer in silver (see it here with our blue and white bedding), and this past Fall, I painted it gold to compliment our new Fall bedding – you can see the masculine-meets-feminine look here. That wraps up my tour today – I know it was a long one, but there are just too many gorgeous angles not to share! PIN THE IMAGE BELOW FOR LATER! OUR NEW BACKYARD PATIO REVEAL: PERFECT FOR ENTERTAINING! CHRISTMAS LIVING ROOM: GORGEOUS DECOR FROM WALMART! 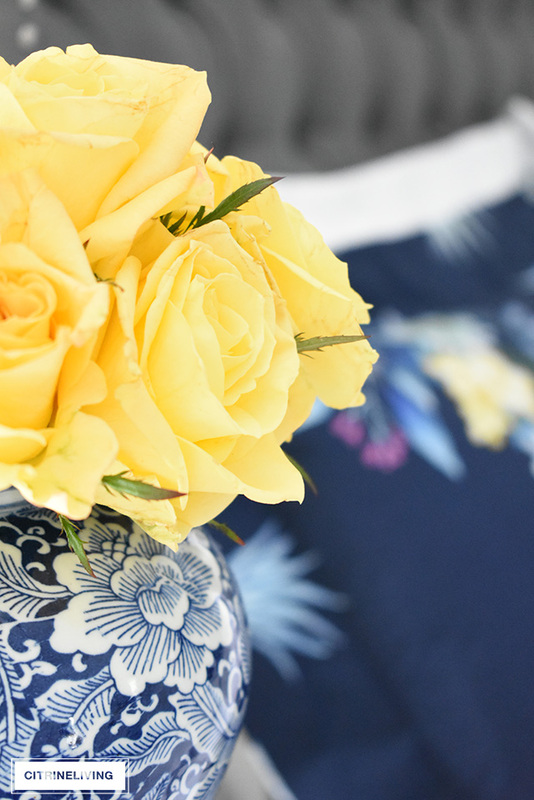 Try a fun new print- I’m always so plain! Thank you Kel! I’m thrilled you like it! 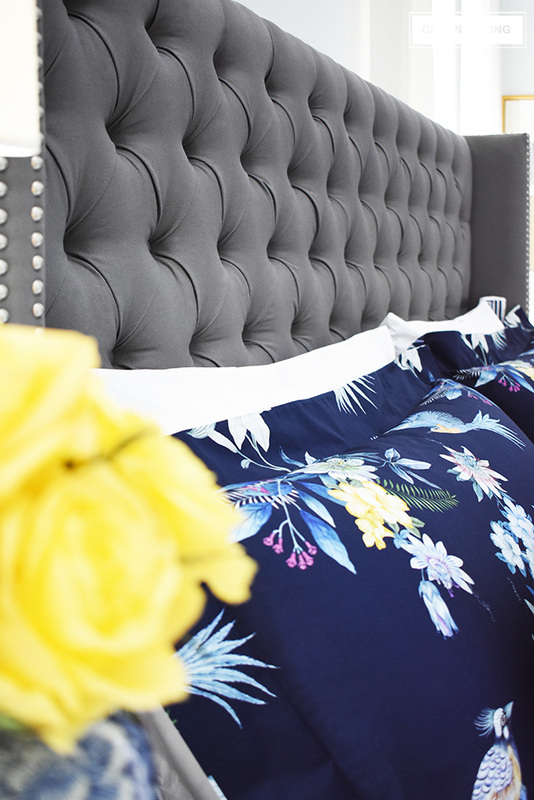 We are so in love I can’t even begin…I HAD to have this bedding! 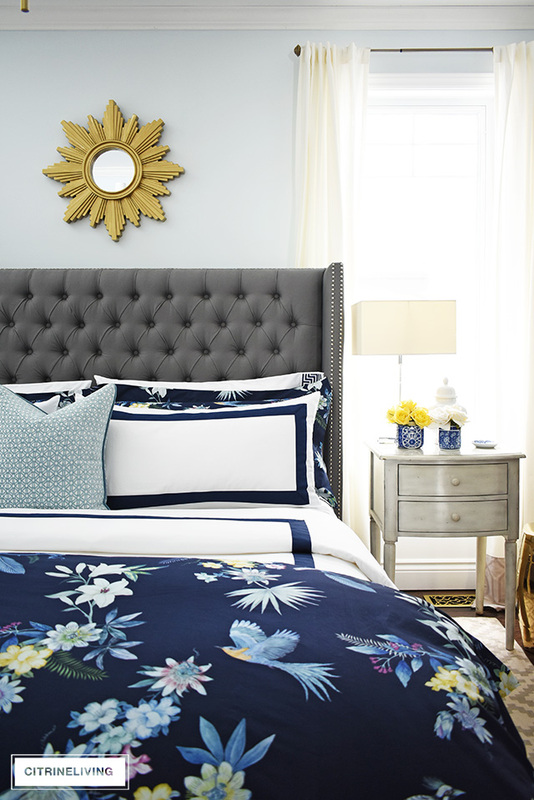 Now…every single bedroom you’ve ever designed is a showstopper! Thanks for stopping by! Muah!! It’s beautiful and screams spring and summer. 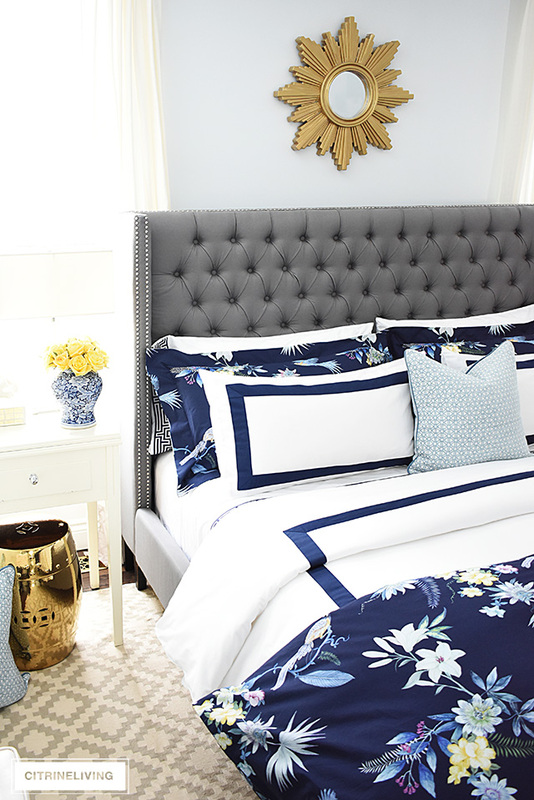 I have the same bed and also have navy and white. I have been transitioning to spring pillows and accessories . Yours is truly beautiful. Cathy, thank you so much!! We couldn’t be happier with how it turned out in our space! 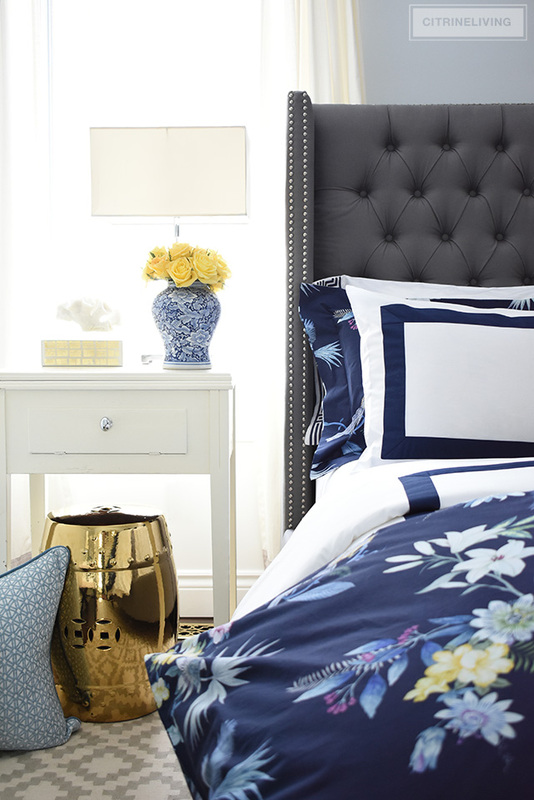 Your bedroom sounds just gorgeous – you can never go wrong with navy and white!! I am loving this set! Such a pretty pattern and COLORS! It is very refreshing and uplifting to see something other than dreary grey. Tam that bedding is so gorgeous! 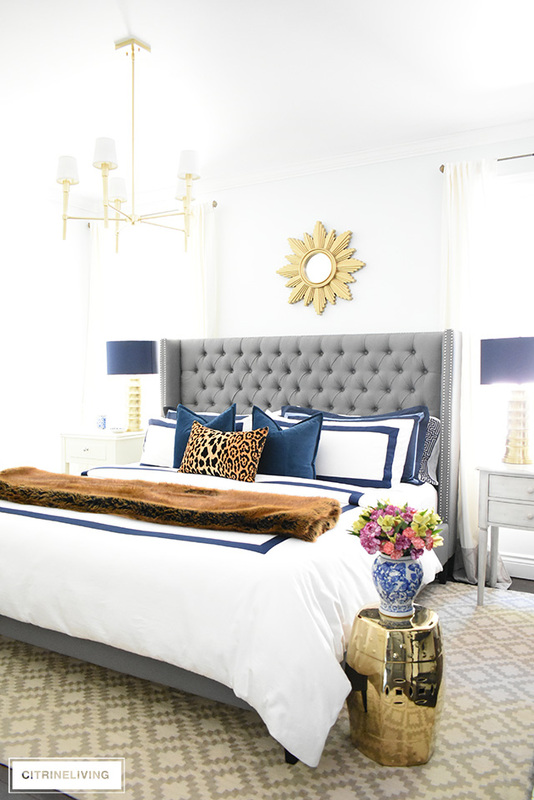 I love the way you styled it in your stunning bedroom! You have such a gift for design! I’m inspired!!!! I love this look. 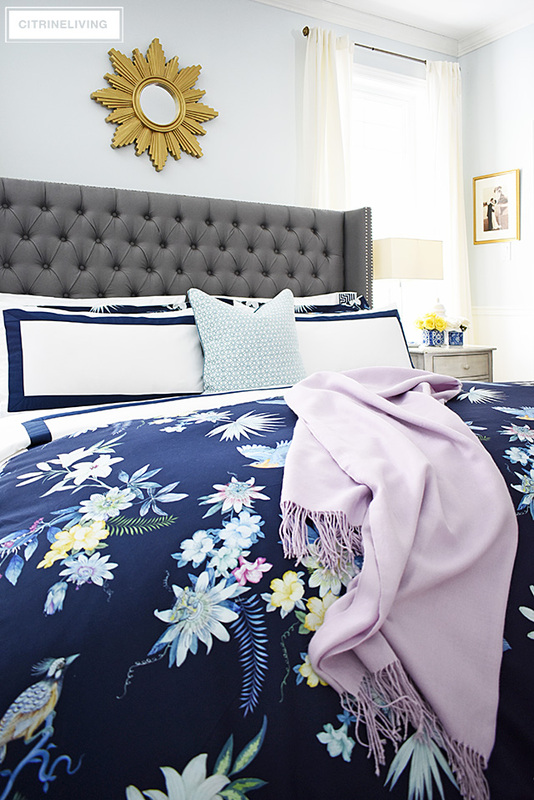 The mauve in the bedspread is the colour of the year!! 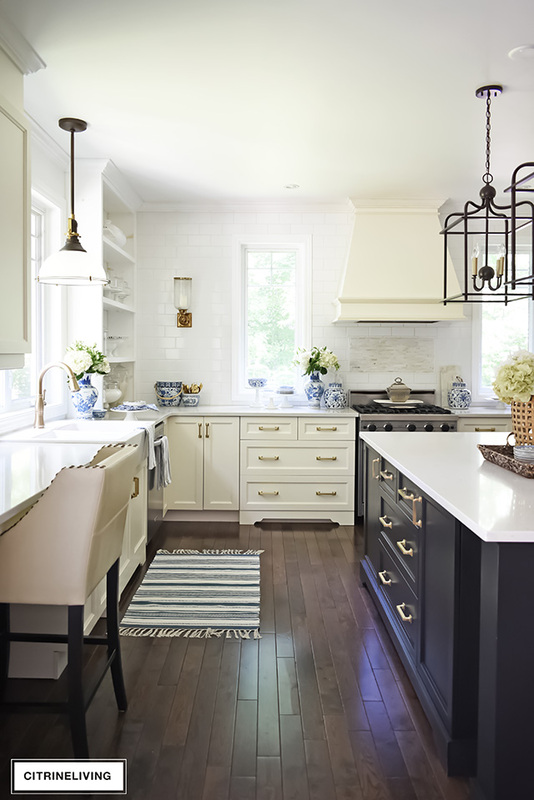 Such a pretty and fresh look! Tam, this is so gorgeous! 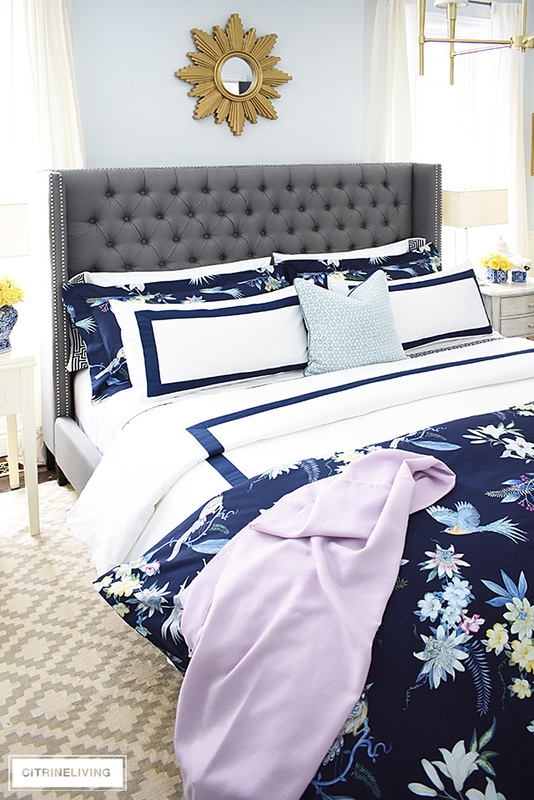 I am thrilled to see that William Sonoma Home’s has such amazing bedding options. The closeup shot you got shows the quality and I can tell it looks incredible in person! Absolutely perfect!!! This is a beautiful update. I love Williams and Sonoma Home. I have two of their duvets and love changing them out seasonally! hi Tam, this master retreat is just that a wonderful, classic retreat. 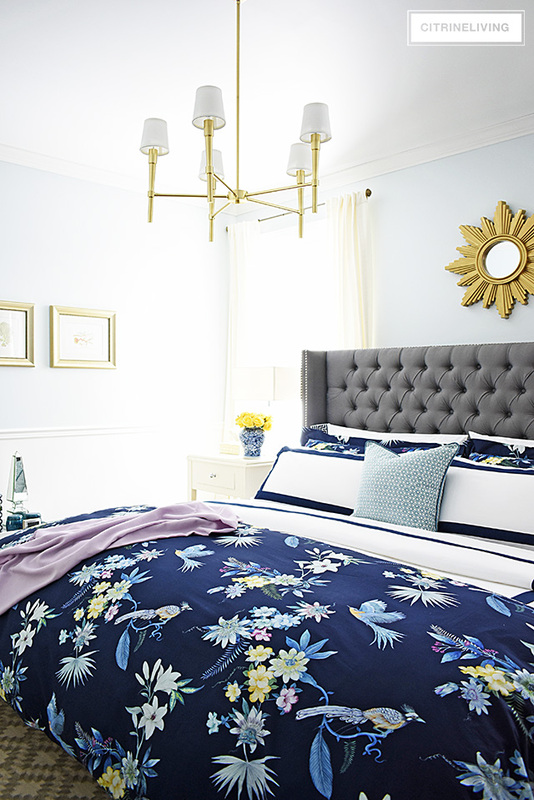 Love the bold colors that also at dreamy and calming. 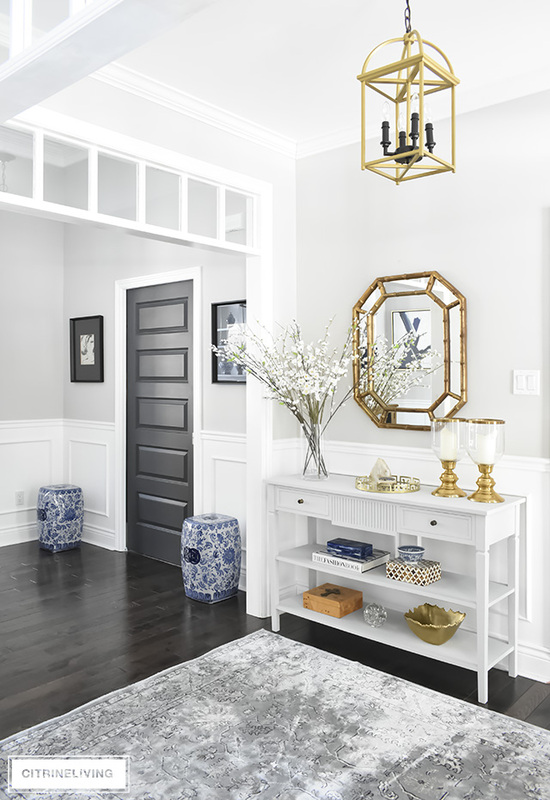 Such a pretty spring and summer look in your classic home. I want the latest news! Sign me up for the newsletter! SIGN UP HERE TO GET MY LATEST POSTS BY EMAIL! Click here to read more about me! 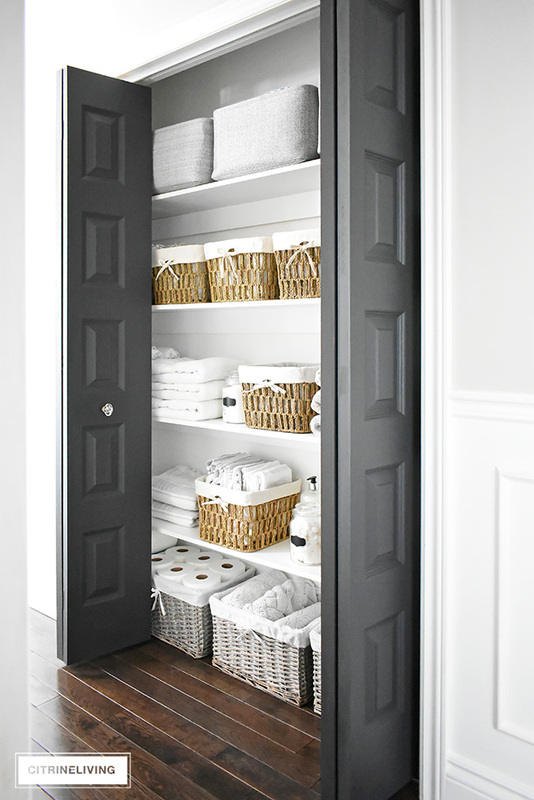 POPULAR POST : LINEN CLOSET MAKEOVER! 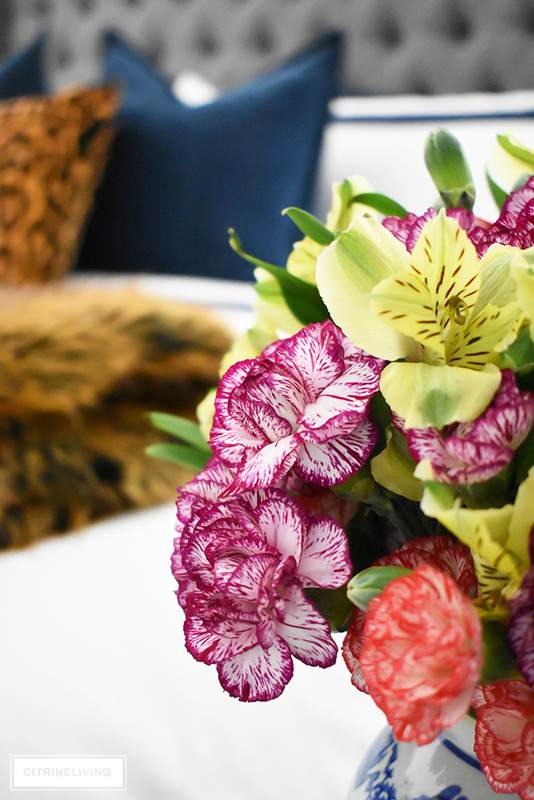 POPULAR POST : DINING ROOM MAKEOVER!